Stunning beach and ocean views - perfect for families! DISCOUNTS APPLY FOR STAYS OF 3 OR MORE NIGHTS! This contemporary apartment is located in a small, prestigious security block of 6 apartments situated on the beachfront. The Outlook on the Beach is fully equipped with great attention to detail. Hotel quality bed and bath linen with your beds made up for you on arrival. Our Caretaker/Manager will meet you at the apartment on your arrival and again when you depart. LOCATION LOCATION LOCATION! 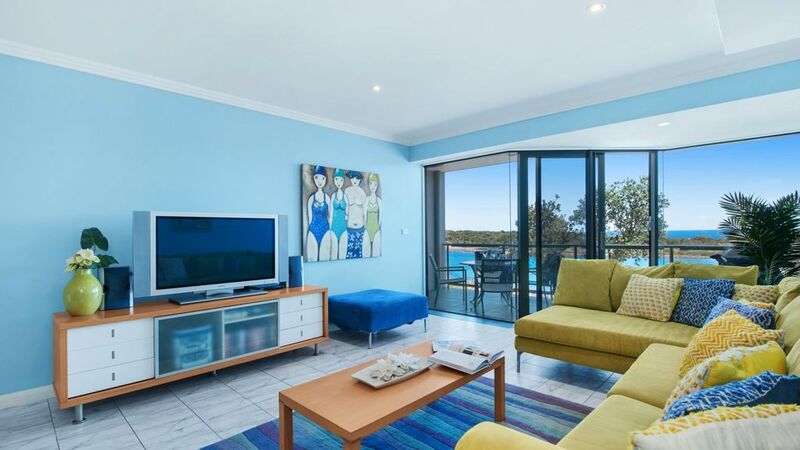 Situated in a fantastic beachside position looking straight onto Boat Harbour beach. - launching boats from the boat ramp on one side of the beach (thus the name Boat Harbour). Anna Bay shopping centre is just 3 minutes drive away.Tennis courts are around the corner and are available for booking. "The accommodation is great! We really had a great time there in The outlook 2. Our girls loves those cookwares especially! Of course, we all love the view from the balcony and the huge TV as well. Thank you very much! " Two of Port Stephens best surfing beaches are located on either side of Boat Harbour - One Mile Beach and Birubi Beach, both reknowned for their great surf. Stockton Beach (2 km away)stretches all the way to Newcastle and is famous for its sanddunes and 4 Wheel Driving. Tours of the Dunes and 4 Wheel Drive tours can be organised. There is a nice coffee shop right on Birubi Beach which has stunning views along the whole of Stockton Beach to Newcastle. The town of Nelson Bay is a 7 minute drive away, as are the bay beaches of Dutchies and Little Beaches. Shoal Bay and Fingal Bay are little further around the Bay. Tours available include Dolphin watching - Whale watching - Fishing - 4 Wheel driving - Dune tours -Bay and Myall river tours. Or just fishing off the rocky outcrops of Boat Harbour. Land line provided for local calls. Mobile coverage is poor in Boat Harbour so we suggest using Messenger, FaceTime, Skype or another internet facility. Self contained kitchen with oven, electric stove top, microwave, dishwasher, granite benchtops. Board games are provided for your entertainment. A lovely quiet unit complex with stunning outlook. Unit was beautifully presented & location could not be better. Beds were comfortable & kitchen well appointed. Would love to come back in the warmer months so we could enjoy more swimming in the bay. We've stayed in Boat Harbour at a number of places over the last 6 years. This was our second year in a row at The Outlook 2 and we will definitely be going back. Perfect location with the park and easy access to the beach which is generally kid friendly. The apartment has everything you need and it's very relaxing just chilling on the balcony enjoying the view. If you need bigger waves there are some great surf beaches within 5 minutes drive. Whilst Boat Harbour is very chilled and laid back the rest of Port Stephens is very accessible with a short drive if you need. Sussanna, who has greeted us both years for the keys and apartment handover, and Glenyss are very easy to deal with. We love it here. Our second time and will come again. I am glad you enjoyed your stay with us again. We look forward to your next visit. Superb location. Only a couple of hours drive from Sydney. Very clean and spacious three bed secure apartment with a large balcony. Everything you need is available in-house. Nice beaches close by. Also Anna Bay. Nelson Bay, Shoal Bay within a short drive or a cycle ride. We thoroughly enjoyed our stay. We sure will be back in summer. This is a beautiful apartment in a magic location. We loved the beach and the bays. The apartment is very comfortable and was very well equipped. Loved sitting on the balcony and watching the water. Will be back.